DISNEY TITLE STICKERS FROM EK SUCCESS -DISNEY VACATION. 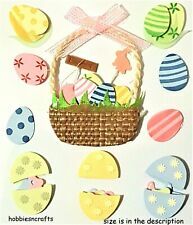 EGG BASKET. 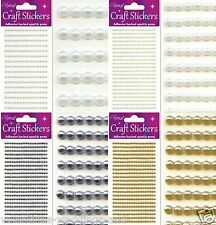 These stickers are made from wonderful materials that make them look as near to the real thing as possible.Jolee's use epoxy resin, wire, wood, plastic, fur, foam, beads, fabric, card, foil, buttons, lace & many other materials in their stickers. Jolee's stickers are made from materials that make them look as near to the real thing as possible. Jolee's use epoxy resin, wire, wood, plastic, fur, foam, beads, fabric, card, foil, buttons, lace & many other materials in their stickers. WHITE DOVES. 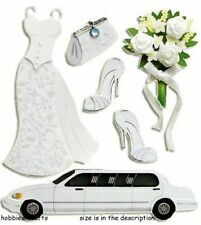 They would grace any greetings card, scrapbook & many other projects to give that quality touch & make them stand out. 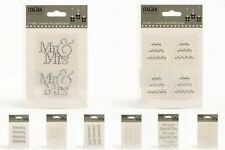 They do not have the adhesive back but can be stuck on with double-sided tape, glue or sticky dots. Create your own stunning handmade Advent calendar using the Simply Creative Silver chunky Advent stickers. Each set contains 48 stickers. - Includes 48 stickers. - Adds a personal touch to your crafts. 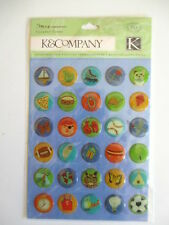 A great value set of fun puffy stickers from Dovecraft Junior. Create your own stunning handmade Advent calendar using the Simply Creative Gold chunky Advent stickers. Each set contains 48 stickers. - Includes 48 stickers. - Gold foil effect. - Adds a personal touch to your crafts. STICKO STICKERS - FUNHOUSE BLUE ABC - 87 PIECES. Include illustrative detail on your delicate Bee Happy projects with this selection of Puffy Stickers. • 17 Puffy Stickers. These stickers are made from materials that make them look as near to the real thing as possible. Jolee's use epoxy resin, wire, wood, plastic, fur, foam, beads, fabric, card, foil, buttons, lace & many other materials in their stickers. DISNEY TITLE STICKERS FROM EK SUCCESS - PRETTY AS A PRINCESS. Aqua Heart Stickers Stickers - 25mm each. Material - Self Adhesive Waterproof Durable Vinyl. We are proud to bring you these labels with the best possible price. Manufactured in UK by Party Decor. K&CO CLEARLY YOURS - ROUGH AND TUMBLE ICONS. Add a finishing touch to your Nature’s Grace projects with this selection of puffy stickers. EK SUCCESS-Touch Of Jolee's Dimensional Stickers Mixed media dimensional stickers in a variety of themes and designs perfect for any and every occasion This package contains an assortment of dimensional stickers on one 7x2-1/2 inch sheet Comes in a variety of designs Each sold separately Not edible, for crafting purposes only Imported. .
Paper House-3D Sticker. These stickers literally pop right up off of the page. It is a fun way to accent any project. This package contains a variety of stickers on one backing sheet . Add a finishing touch to your Nature’s Grace projects with this selection of puffy stickers. Features & Benefits. Purple Heart Stickers Stickers - 25mm each. Material - Self Adhesive Waterproof Durable Vinyl. We are proud to bring you these labels with the best possible price. Manufactured in UK by Party Decor. Royal Blue Heart Stickers Stickers - 20mm each. Material - Self Adhesive Waterproof Durable Vinyl. We are proud to bring you these labels with the best possible price. Manufactured in UK by Party Decor. EK SUCCESS-Jolee's Boutique: Dimensional Stickers Mixed media dimensional stickers in a variety of themes and designs perfect for any and every occasion This package contains Graduation: five dimensional stickers on one 6-3/4x3-3/4 inch backing sheet Not edible, for crafting purposes only Imported. .